Continental Motors has issued a Service Bulletin for many of its models related to the fuel (primer) diverter valve and a malfunction that can result in a loss of power. Purpose: To assist Owners, Operators, and Maintenance Facilities with instructions to remove the fuel diverter valve assembly and provide available options to the fuel injection system for continued service. Continental Motors has received reports of fuel (primer) diverter valve malfunction that can result in a partial or complete loss of power. The fuel diverter valve assembly allows a small quantity of fuel to accumulate in each induction manifold for engine priming and to improve starting efficiency. The panel-mounted PRIME switch commands the airframe boost pump, delivering fuel flow through the priming nozzles for current design pre-start priming. Introduction of the cylinder drain connector serves the same priming function and allows the removal of the fuel diverter valve assembly from current production model specifications. CAUTION: Over-priming can lead to cylinder/piston hydrostatic lock. Reference the AFM/POH (Airplane Flight Manual/Pilot’s Operating Handbook) for fuel mixture settings, priming times, proper engine ground starting and inflight restarting techniques to prevent inadvertent over-priming. This Service Document provides instructions to reroute fuel flow from the mixture control outlet directly to the fuel manifold valve assembly. 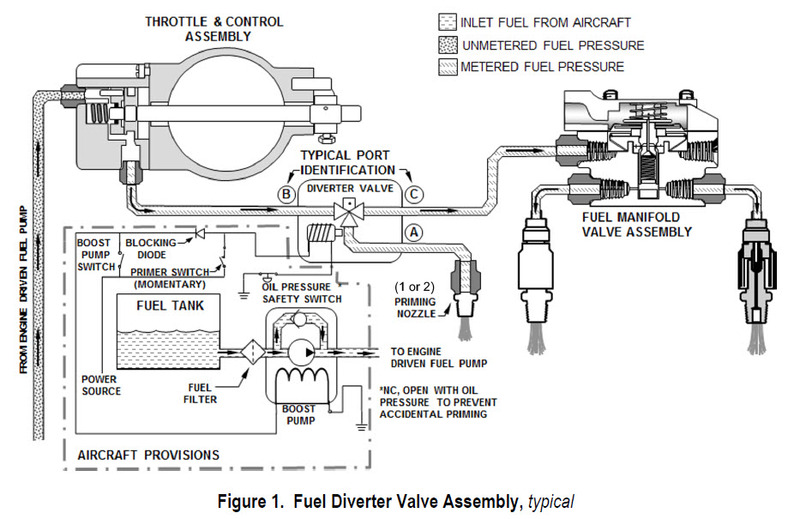 This procedure will remove (bypass) the fuel diverter valve assembly from the fuel injection system and terminate electrical connections servicing the fuel diverter valve assembly. This Service Document updates the manufacturer’s Instructions for Continued Airworthiness (ICA) for determining “serviceable condition”. This procedure should be added to the “Engine Fuel System Inspection Checklist” and a copy of this bulletin must be inserted into the most current version of the applicable Maintenance and Overhaul manuals (as listed in the “Models Affected”) until the data is incorporated into the manual, by revision, or the service document is retired. Click here to download the entire bulletin.